President Xi Jinping congratulated on the establishment of the Chinese history research institute under the Chinese Academy of Social Sciences (CASS) Thursday. On behalf of the Communist Party of China (CPC) Central Committee, Xi, also general secretary of the CPC Central Committee and chairman of the Central Military Commission, extended congratulations to the institute and sincere greetings to history researchers nationwide in a letter. Noting that "history is like a mirror for people to draw wisdom for modern times," Xi called on researchers to "better learn from history, uncover the law of history and grasp the historical trend." He called for "accelerating the building of the disciplines, academic and discourse systems of history research with Chinese characteristics." Xi expressed his hope that the institute could team up with and lead historical researchers across the country in studying Chinese history with the methodological approach of historical materialism, to bring about a series of masterpieces that provide penetrating insight and a group of historians with thorough knowledge of the West and China, contributing to Chinese history research and related international exchanges. 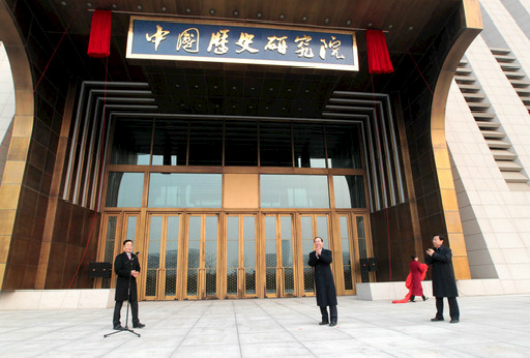 The letter was read out at an event marking the inauguration of the institute in Beijing. Huang Kunming, a member of the Political Bureau of the CPC Central Committee and head of the Publicity Department of the CPC Central Committee, delivered a speech at the event, calling for efforts to make the institute a success and urging researchers to follow the correct political direction and improve Chinese history research levels, thus contributing to national rejuvenation.